For many, many years now I have tried so many pain relievers. Everything from pills to creams and in between! No seriously I have. Having Fibromyalgia my muscles can tense up and the more I hurt the more I tense up, it's very irritating. I have some things that help but when I wanted something easier and I was having a hard time finding something that would work. Until now! 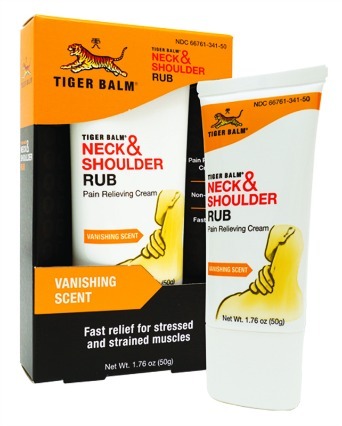 I received the Tiger Balm Neck & Shoulder Rub and to my surprise it works! Like it really, really works! All you need to do is rub some of the creamy, camphor-menthol blend on your neck & shoulders and wait a few minutes for the pain to ease. I love that the formula is water based so all I need to do is wash my hands once and the cream was off my hands. Unlike some other rub on pain relievers. The tube is small and convenient to put in my purse for those long days in the car, or to keep by my computer while blogging! If you go to the Tiger Balm Facebook page and "like" them, then you can enter to win a trip for two to beautiful Mendocino County in Northern California. The sweepstakes includes airfare, hotel and $1,000. And right now you can also save $2.00 on Tiger Balm products.